Float like a butterfly, sting like a bee, pop into a cornfield. 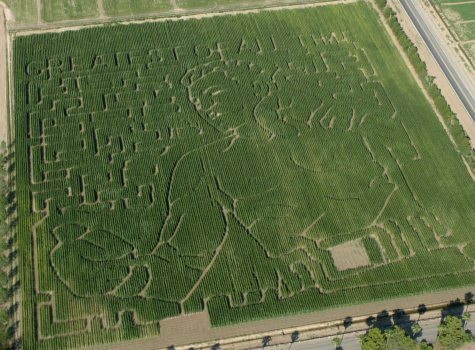 Boxing great Muhammad Ali took a helicopter trip to Queen Creek Tuesday morning for a surprise honor – seeing his own image cut into a 10-acre cornfield at Schnepf Farms as part of the farm's sixth annual celebrity corn maze. Wife Lonnie Ali said Muhammad was amazed by the image. She was impressed, too, at how well the carving captured her husband's face. Muhammad Ali couldn't talk to the media gathered himself – Parkinson's disease has left him barely able to speak and needing help to walk – but close observers could get occasional hints about what he thought of the entire affair. For instance, a small smile slowly crept across his face after Lonnie handed him his own framed photo of the maze. And as Ali sat in a chair so people could pose for pictures with him, that smile returned when a crowd of kids came up and the girl who crawled into his lap gave him a big hug. The Alis bought a home in Paradise Valley two years ago to be near friends and the Muhammad Ali Parkinson Center in Phoenix, as well as to get the benefits the sunny climate has for Parkinson's sufferers, Lonnie Ali said. They spend six to eight months out of the year in the Valley. And the Alis aren't strangers to Schnepf Farms. Lonnie Ali said they love coming to pick apricots. “The apricots from this farm, they are like putting a bon bon in your mouth,” Lonnie Ali said. Muhammad Ali, a three-time heavyweight boxing champion, joins a club of five other celebrities whose agri-portrait has graced the field: CNN commentator Larry King, comedian Jay Leno, talk show host Oprah Winfrey, ex-Arizona Diamondback player Luis Gonzalez and Phoenix Suns player Steve Nash. Radio disc jockey Dave Pratt, morning host for KMLE (107.9 FM), broadcast his show live from the farm for the unveiling and played recordings of previous honorees King and Gonzalez congratulating Ali. Schnepf Farms owner Carrie Schnepf was pleased at how well this year's maze unveiling went. Even the corn cooperated, growing greener and lusher than any of the farm's other celebrity fields, Schnepf said. “I don't think I could have asked for anything better,” Schnepf said. And Schnepf has no idea what she's going to do to top Ali's image next year. The cornfield and its 3 miles of winding trails will be open to the public as part of Schnepf Farms' annual Pumpkin & Chili Party, which runs Thursday through Sunday through Nov. 2.